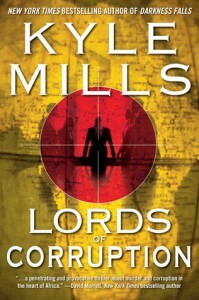 Lords of Corruption - Kyle Mills - review - "Check Six"
In [b:Lords Of Corruption|5971959|Lords Of Corruption|Kyle Mills|http://d.gr-assets.com/books/1328753290s/5971959.jpg|6145020], Kyle Mills does for Africa and charitable organizations what Peter Benchley did for swimming at the beach. In this short thriller, Mills' gives us a young college graduate who is hired to run an agricultural project in an unnamed African nation for a charitable organization. Problem is the charity is just a front for a Russian crime lord and the warlord running the country. Most of the money donated is siphoned off to the crime boss and warlord, and many other nefarious enterprises are carried out. The new kid (hired to replace the murdered previous "do-gooder") finds out about the crimes going on with the help of a jaded news reporter and a beautiful Norwegian babe (why not!). Can the young man, the reporter and the girl outsmart the warlord, the crime boss, anyone? A fast-paced thriller that will definitely make you think twice about going to Africa or donating to charity. I give it 3.5 Stars and will round up because it was just plain fun to read.